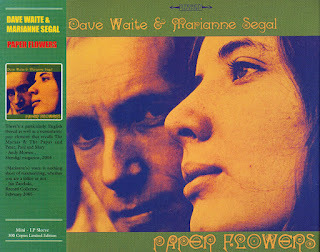 Before the legendary 70s UK folk rock band Jade, there was a folk duo - Dave Waite and Marian Segal.Dave & Marianne at the Holy Ground Folk Club Well known on the live circuit of the mid to late 60s, Dave and Marian slung their guitars in the boot of their Triumph and travelled the Universities and folk clubs of England at a time when folk was groovy and Carnaby Street was still swinging. 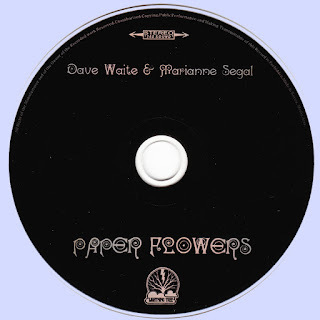 In part comparable to Sandy Denny and The Strawbs and with the folk pop sensibilities of US West Coast contemporaries such as The Mamas and Papas, Paper Flowers is a rare acoustic snapshot of an era known more for its volume and wild theatrics than for its gentle rustic melodies. Photo session in a school yard, London Paper Flowers is the sound of summer days in Hampstead, beautiful people, beautiful clothes, incense, innocence and mythic 60s mystery. Marianne and Dave weave magical harmonies on original and contemporary '60s folk material and fans of 60s psychedelia, pop or folk will find much to enjoy on this timeless release. Remastered from the only surviving tapes the album contains fully detailed sleeve notes by Dave as well as contemporary photographs.